Other: cardstock, embossing folder, navy ink. Other: JustNick Cut Files: Speech Bubbles, Simple Card Sentiments, KNK Zing Cutting System, dark brown card base, white thread, sewing machine, Scrapbook Adhesives 3D foam dots and tape runner. Other: Kaisercraft white pearls, kraft card base, white thread, sewing machine, Scrapbook Adhesives 3D foam dots, Tombow tape runner adhesive. 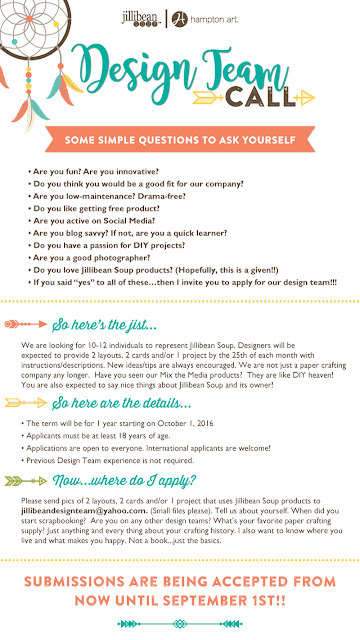 Trims -- Prima Marketing, Inc. Designer Kristine Davidson used a Mix the Media piece to create something for her washroom. The template was created using her Silhouette, which she then placed on top of the wood piece, traced, and filled in lightly with a black oil pen. Other: Silhouette Cameo, black oil pen. Flowers -- Prima Marketing, Inc.
Lace & Jewels -- Prima Marketing, Inc. Here is a layout made for a favorite photo, any shot from everyday life will work. I chose a photo of my daughter’s cat Luna. 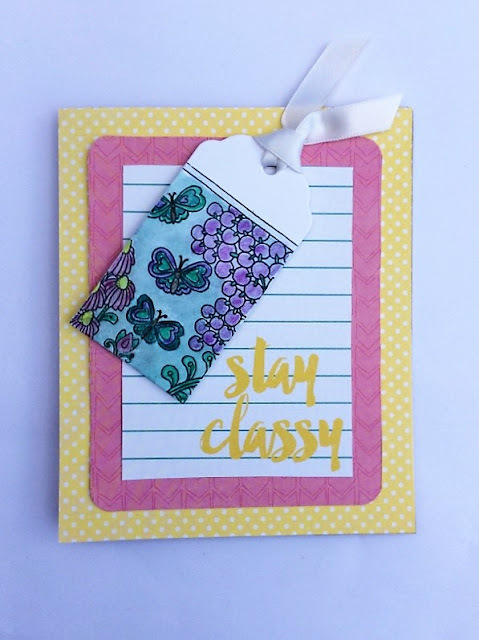 This layout has two brand new Hampton Art tags and uses Healthy Hello Jillibean Soup papers and stamps. This layout began with the star paper as a base, onto that I layered three mats in varying sizes as shown. The Arrow paper first, then yellow cardstock, then the whitewash board paper. The photo was then added with one top left corner rounded off. 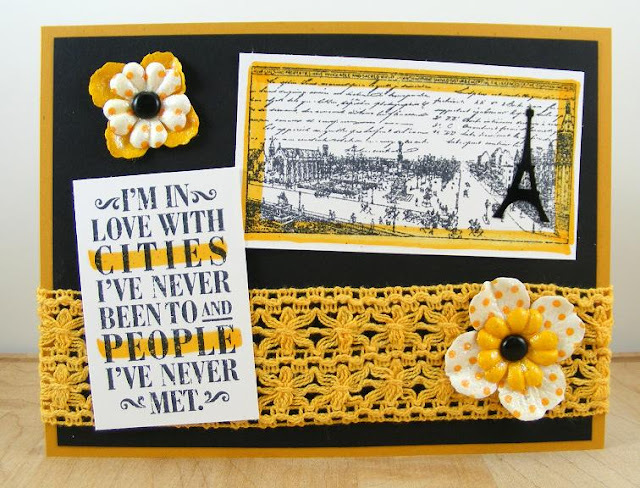 The yellow flower was punched with scalloped circle punch and stitching was added with the sewing machine for some extra texture. 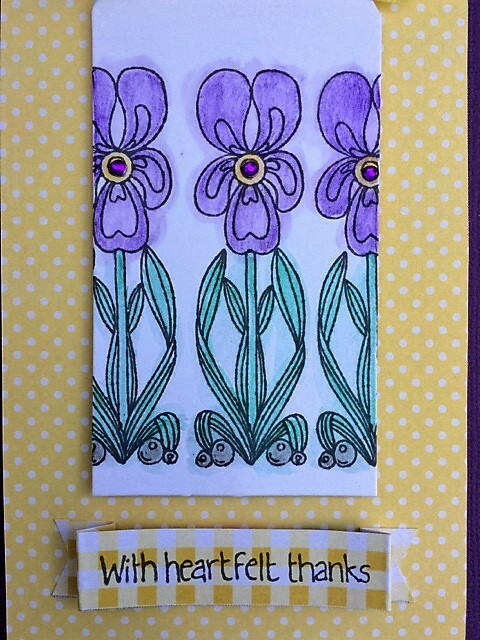 Then it was layered onto the flower kraft tag and added to the layout on top of the bite size bit after stitching was added to it too. 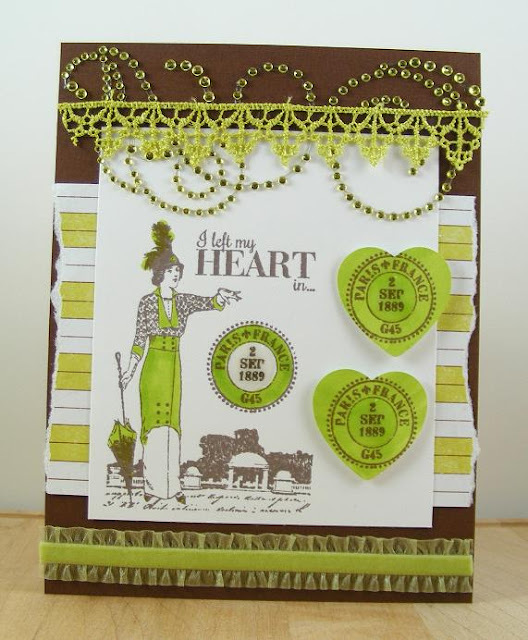 Next the kraft letterpress tag was stamped with the “You Are My Happy” clear stamp in brown ink. I tied the twine into the bow and attached to the layout with adhesive. 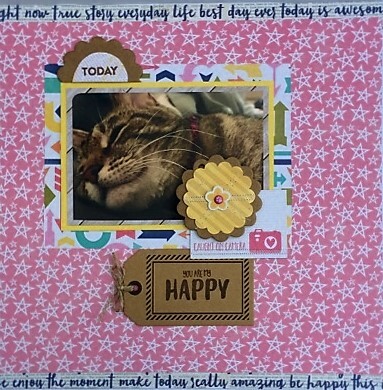 Then I layered a pea pod yellow flower as the center with a cute paw print pink brad center. 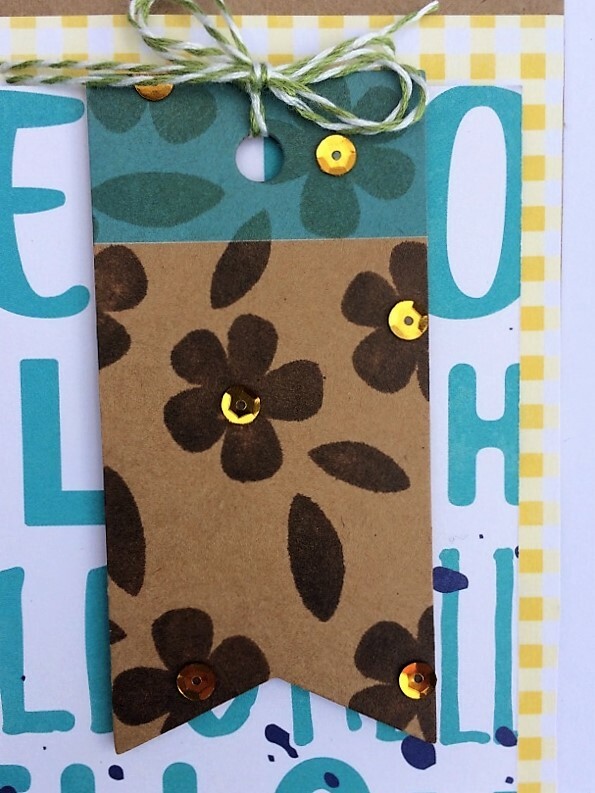 Then I cut one of the kraft flower tags and added the half circle paper. 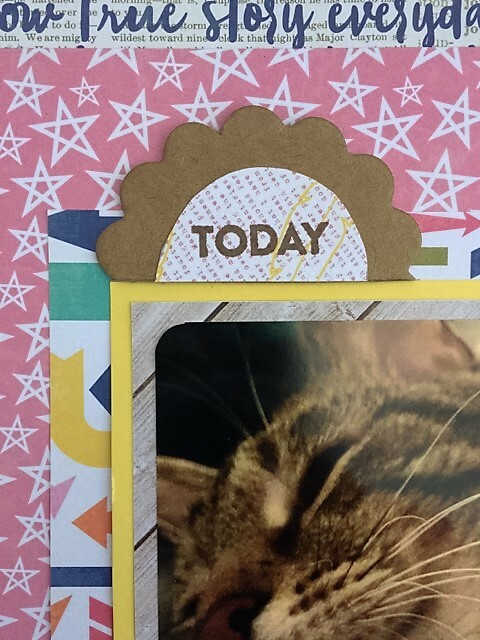 Then I stamped onto that paper the “today” stamp in brown ink. That was attached over the photo on the left corner as shown. Last I felt like it needed something to balance it out so I added the strips of text paper to the top and bottom of the sheet. The layout was complete at that point, simple in design but loads of fun. 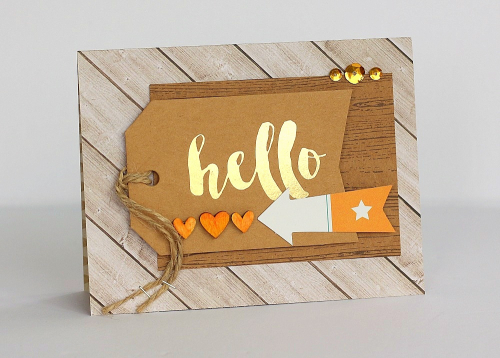 Need a quick and simple Hello Card? 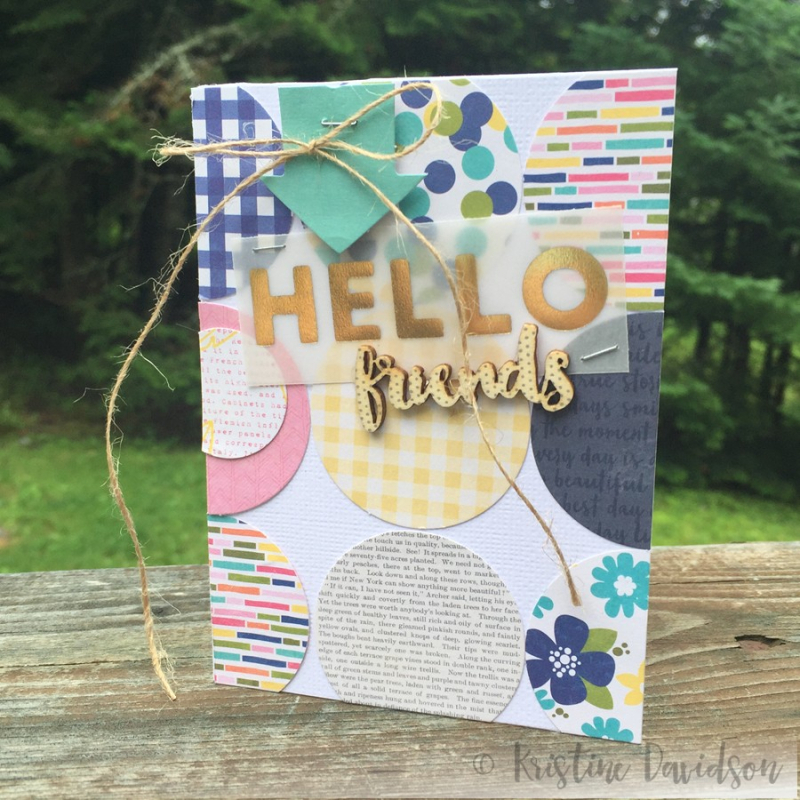 Check this one out featuring brand new Hampton Art kraft banner tag and Jillibean Soup clear stamp set and papers. I began with a kraft card base and layered on a yellow gingham mat. Then using 3D foam dots I added the Hello paper as shown. 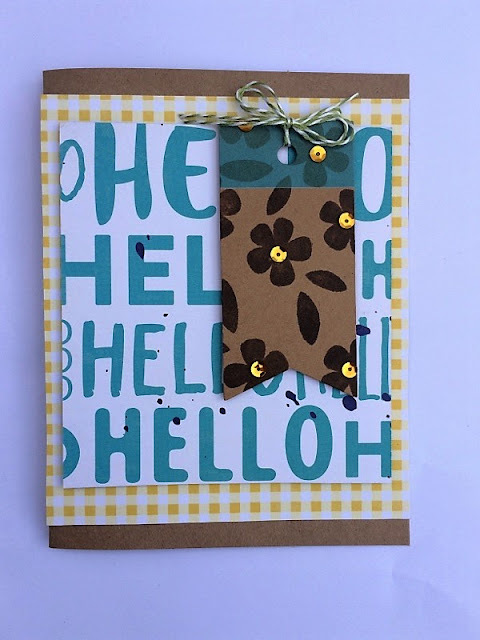 Then I stamped the kraft banner tag using brown ink a pattern of flowers from the Healthy Hello stamp set. Once dry I added the yellow sequins to the center of the flowers. Last I added the bakers twine double bow and attached with 3D foam dots as shown. Really simple and quick to put together. Let me know how you like to say Hello. Say thank you with a trio of purple iris using this brand new stamp set from Hampton Art paired up with a purple and yellow color combo. 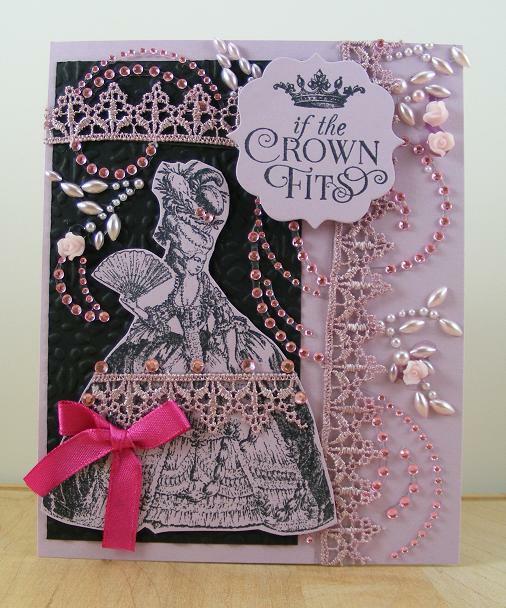 This card started with stamping the iris stamp in gray ink three times as shown on the plain white tag. Then I grabbed my watercolor pencils again and colored the images in. Then I added water using a paintbrush to give it the true watercolor look. 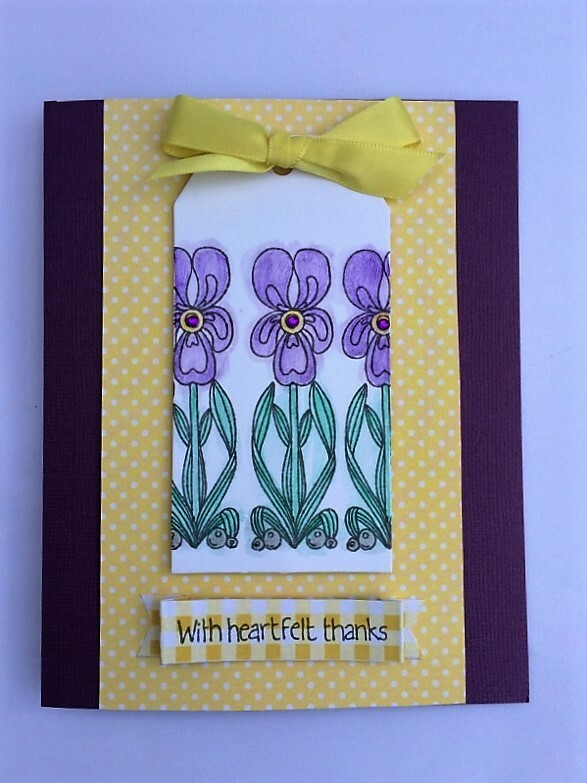 Then I set that aside to dry and cut the yellow mat and added to the purple card base as shown. 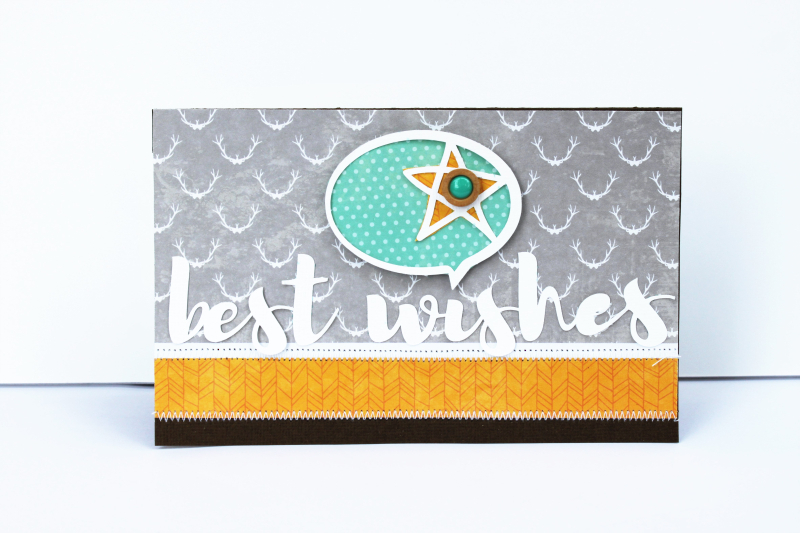 Next I stamped the sentiment onto the yellow gingham paper in the gray ink and cut out and folded to create the raised banner effect. 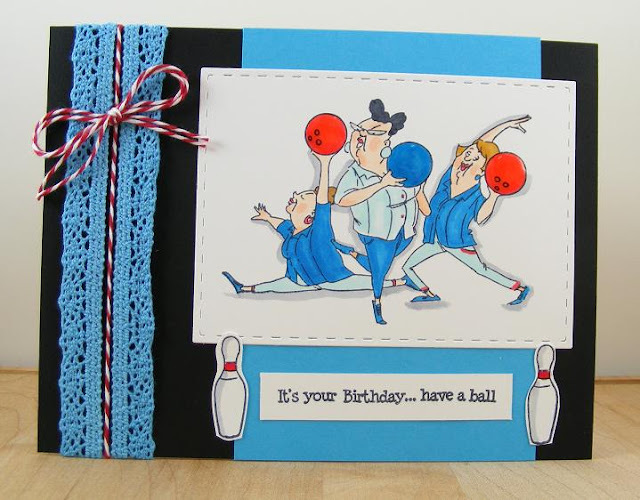 I attached it to the card with 3D pop up dots. A few purple gemstones were added to the center of the flowers for a touch of bling. Last I added a sweet yellow satin ribbon to the top. A nice way to say thank you from the heart. 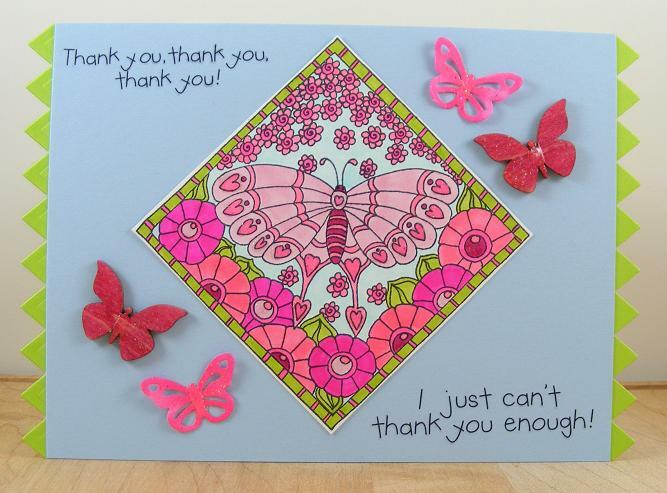 Can you ever really have enough Thank you cards? I am always running out. Here is a colorful card brought to life with watercolor pencils for a classy friend. 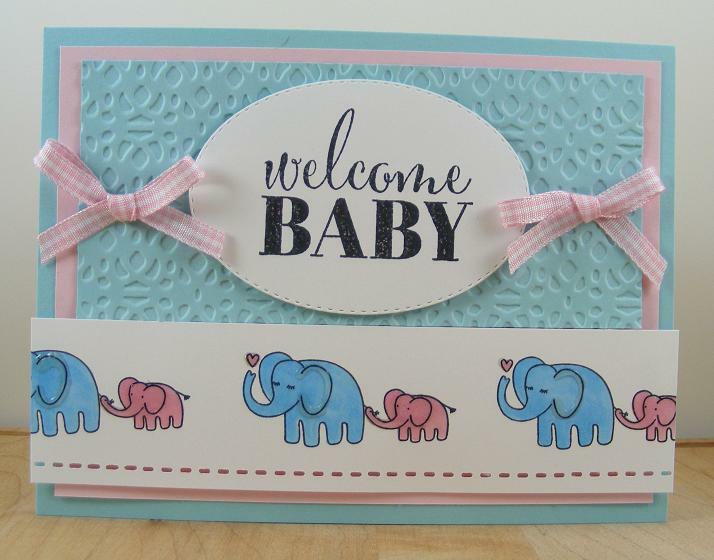 The playful new stamp and tag are by Hampton Art and the papers are Jillibean Soup. 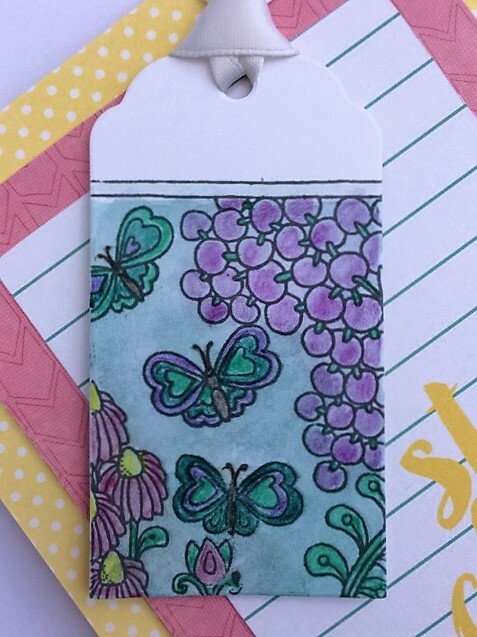 This is another coloring book trend stamp set, first I stamped the image in gray ink onto the lovely watercolor Hampton tag in light aqua. Next I pulled out watercolor pencils to try this time. First you color the image in with the pencils then using a paintbrush you add the water to give it the watercolor look. So fun and easy to create with these! After that all that I needed was the bite size bit mat with the pink mat behind it added onto the yellow polka dot background paper. Before I added the tag, I tied on plain white satin ribbon as shown. So this is a fun card to share with a teen or girlfriend, any excuse to share a smile really. Hope you are enjoying your summer, stay cool! During a family trip to Alabama we had a close encounter with a very sweet baby deer. So a layout to capture the moment was a must- and the new Jillibean Soup Mushroom Medley papers and stamps were a perfect match for the photos. 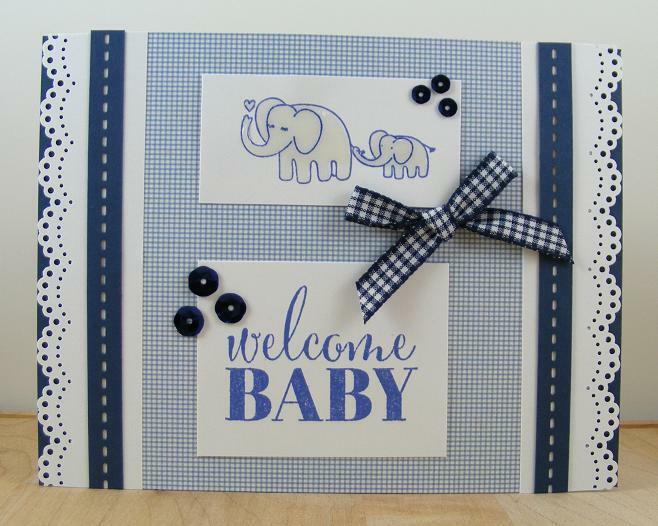 I love when you can create a layout using a very simple grid pattern. This is a grid pattern using 4 squares measuring 4” x 4” each, doesn’t get much easier than that! I chose two photos and two bite sized bits with some fun embellishments thrown in too. The big background mat was cut from Girolles and measures: 9” x 9”. Next I cut the background mats from the Trompettes de Mort one of each side measuring 4”x4”. 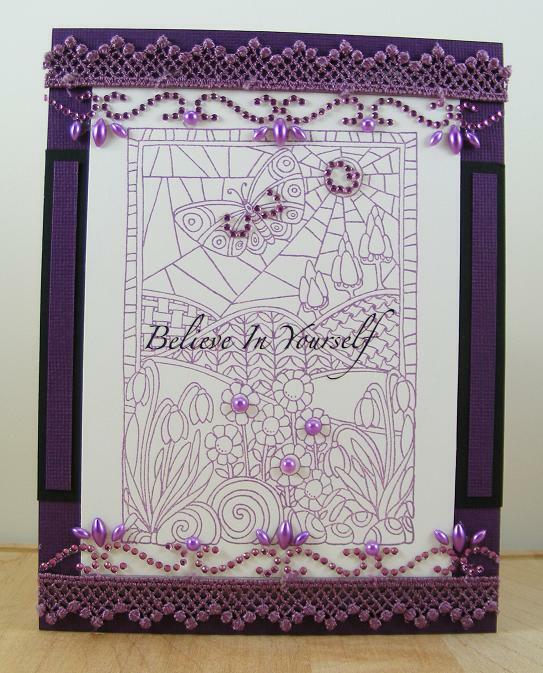 The photos are also 4”x4” and I arranged those 4 pieces as shown onto the big background mat. Next I cut out the two bite size bits I wanted, “You Stole my Heart” and the Aspen Tree design. Those we layered onto the mats as shown. 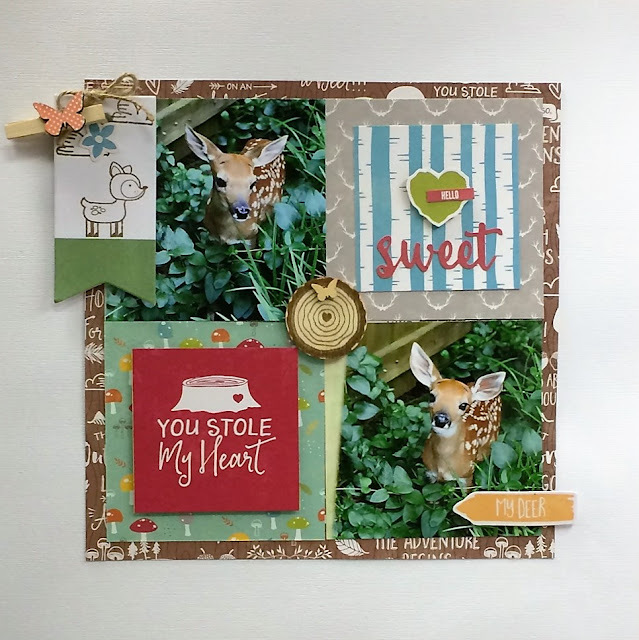 Then I grabbed a new Hampton art tag and using the Mushroom Medley clear stamp set I stamped the deer and clouds directly onto the banner tag as shown. 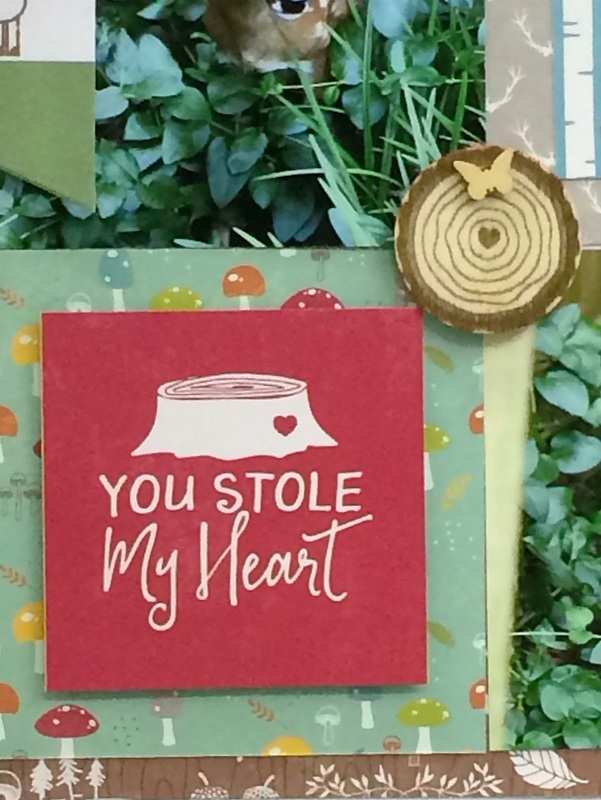 Then I grabbed the fun new wood slice circle and stamped it in brown ink too with the tree trunk design. A perfect accent for this page I thought. 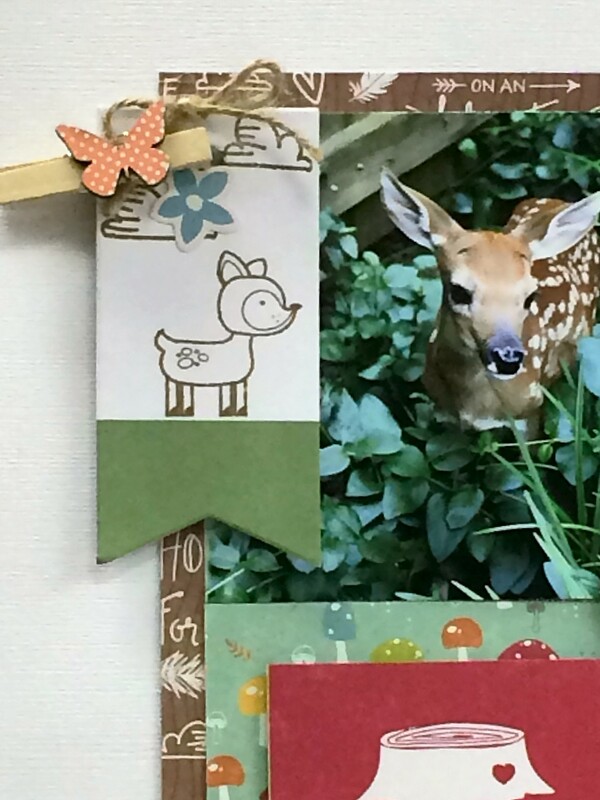 Then I added a few pea pods shapes, the heart with a word sticker, the “my deer” and blue flower. 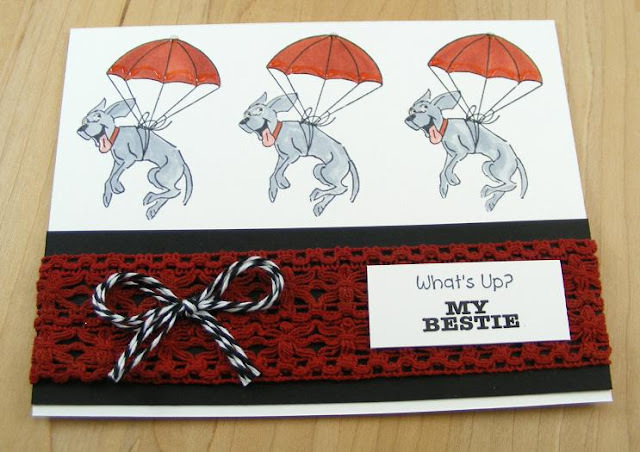 Last I clipped on the twine bow and wood clothespin to the banner tag. This layout is perfect for any of your outdoor photos: vacation, camping, fishing, hiking, boating, etc. I hope you are enjoying your summer outdoor time as much as I am!